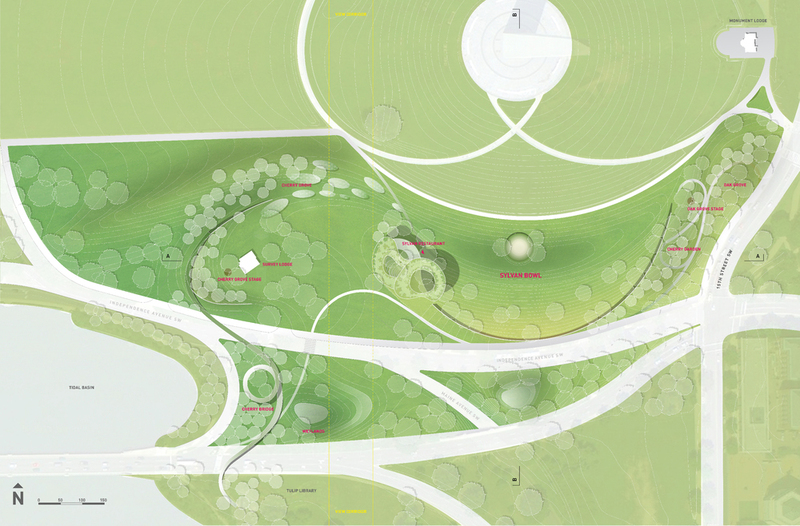 The 21st Century Park is a backbone threaded into the city – not an isolated mass serving one area. 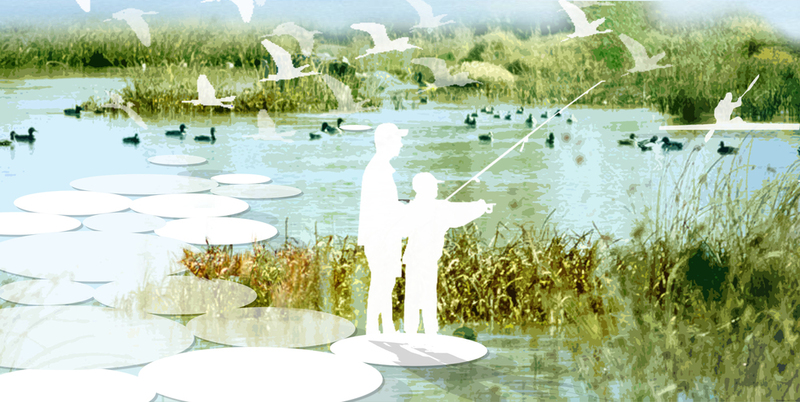 The 21st Century Park is a way to flow through the city – not just a destination. 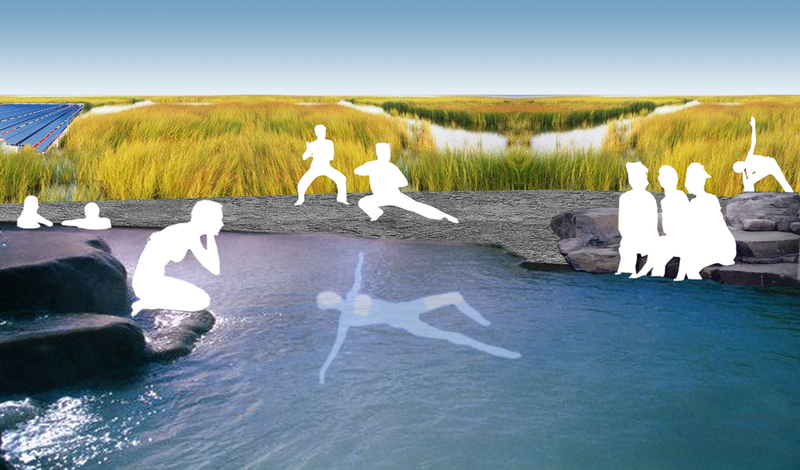 The 21st Century Park is a filter, healing, cleaning, purifying air/water, an active environmental engine. 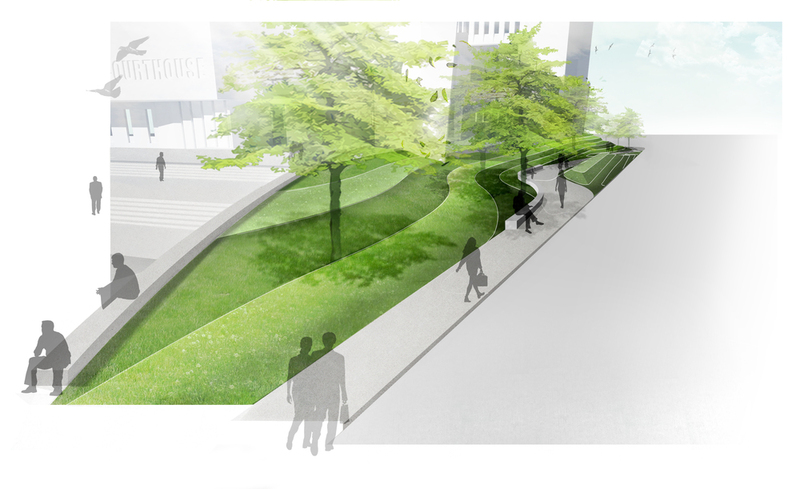 The 21st Century Park is a spine threaded through the city which gives you a way to flow through it. It creates oases along its length. 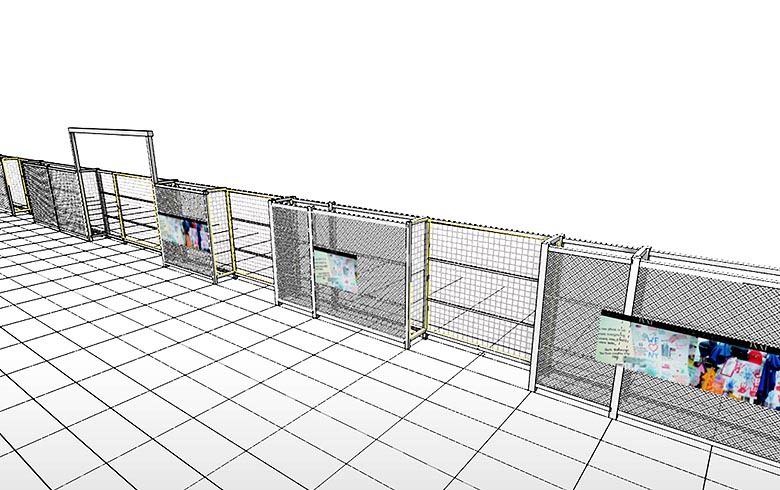 The aesthetics are drawn from how the parts are organized in space. 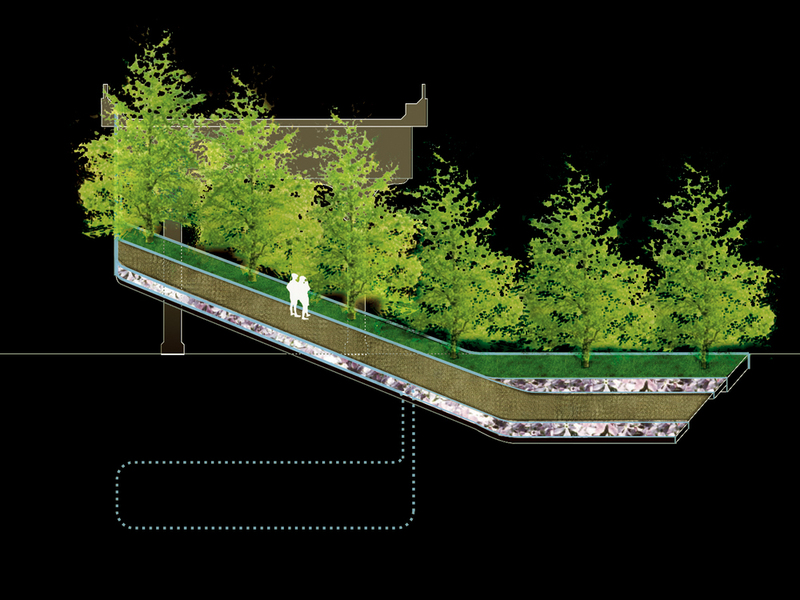 The 21st Century Park engages streets – doesn’t leave them out. The 21st Century Park is a tool for intervening in the City. I got up this morning, it’s Saturday, and decided to go for a run in that new park they just finished. A piece of it runs three blocks from my house but you can go all the way downtown on it. 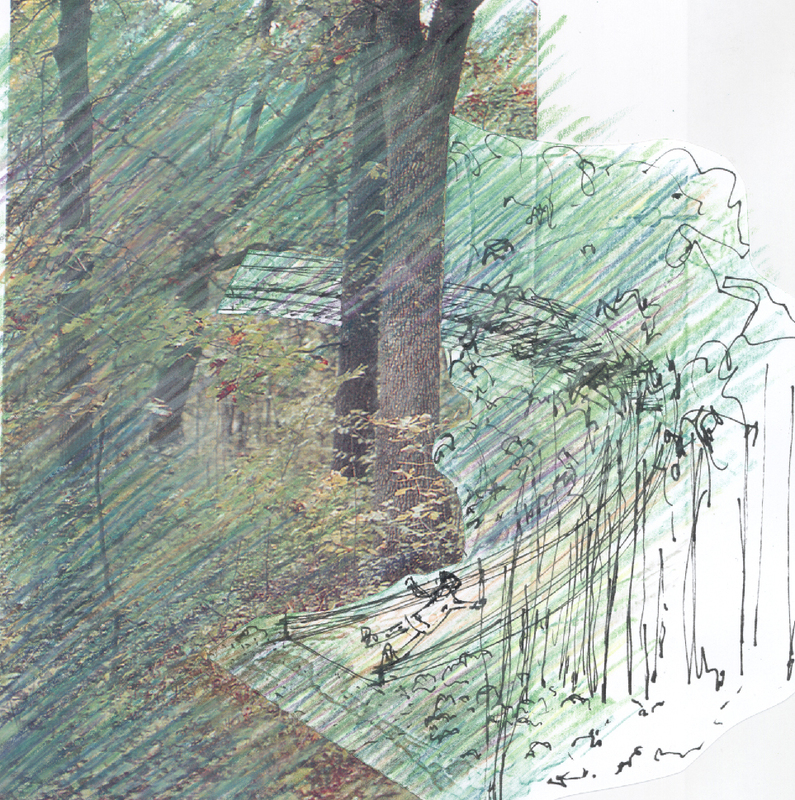 The 21st Century Park is a spine threaded through the city which gives you a way to flow through it. Took the street down from my stop on the EL. It is nice and narrow, full of crabs and haws with chunks of prairie on the sidewalks. As I am coming towards the shore between the trees and shrubs I find myself on the water on a boardwalk with green islands on each side. There is such a great view out here. I see water forever on one side, the shore on the other, lots of birds singing as I run along it. The 21st Century Park is a filter of healing, cleaning, and purifying the air and the water along it. Went down towards Hollywood Beach, by way of the new walk in front of the towers, to get a friend of mine to go running with me. His apartment is on the 12th floor and it is great to look down and see all the green islands. Let’s go swimming, my friend said, so we changed, took along some towels, went out to the curving pier and dove into the water. We took a kayak out after that and had fun going in and out of the water lagoons created by the boardwalks, where the water was clear and calm, and then in the choppy waters outside. 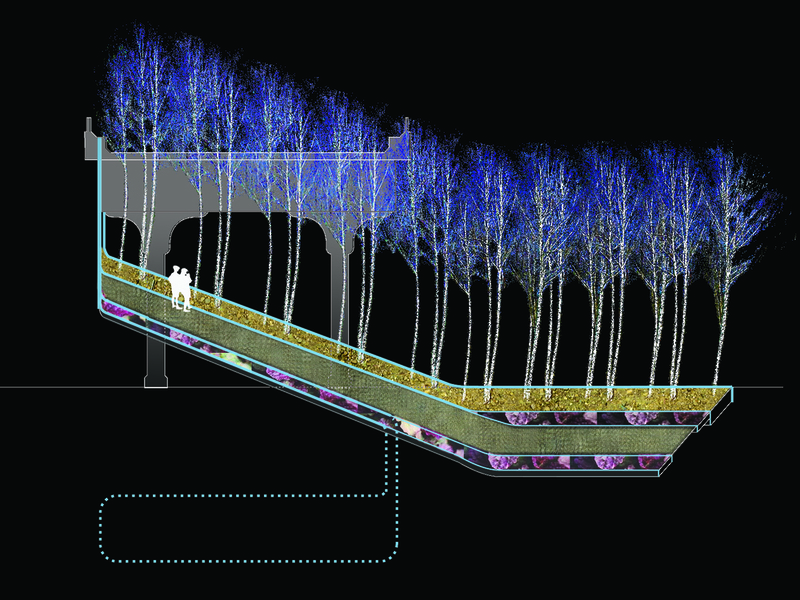 The 21st Century Park is a spine which creates oases along its length. The aesthetics are drawn from how the parts are organized in space. 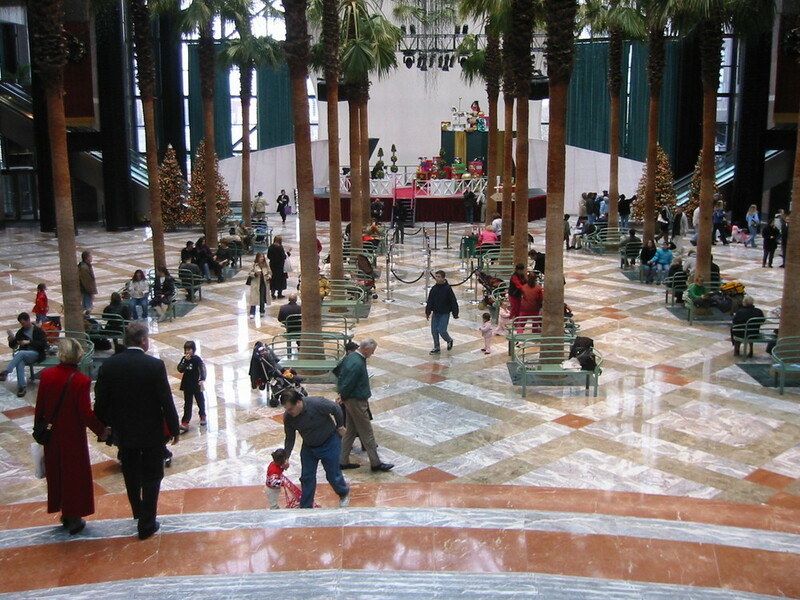 The Winter Garden in Battery Park City’s World Financial Center serves as the cultural center of the 3.5-acre complex. 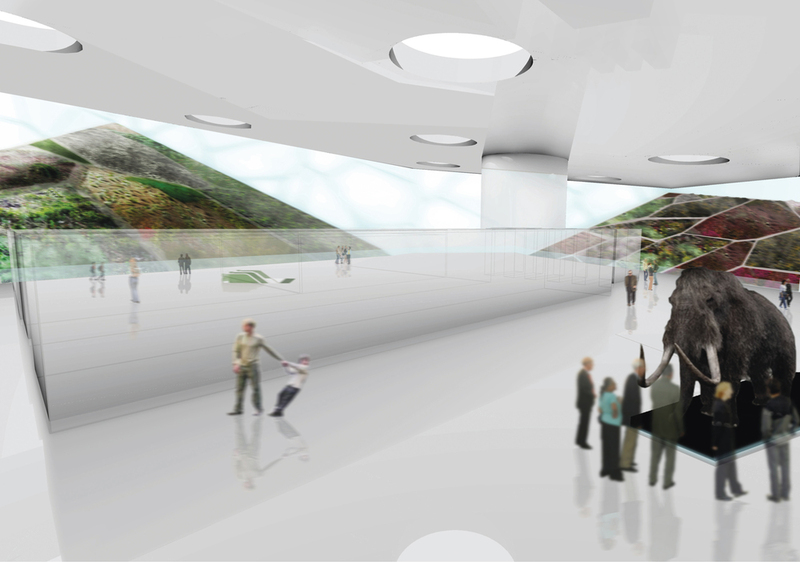 This glass hall is the main connector of all public circulation within the project and with the World Trade Center site. 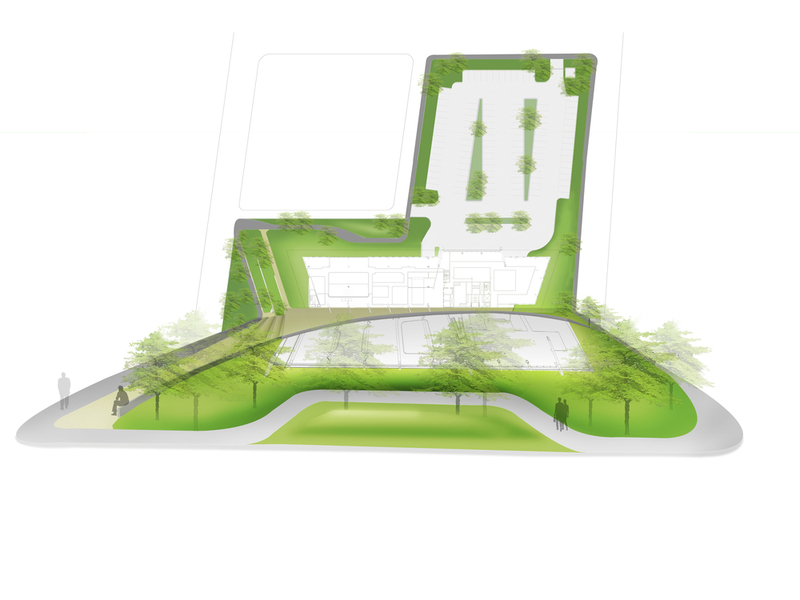 Its success as a public space is due in part to its dedicated programming staff; Balmori Associates worked closely with them, carefully laying out all the activities desired in the space before designing its paving, landscape, and circulation. 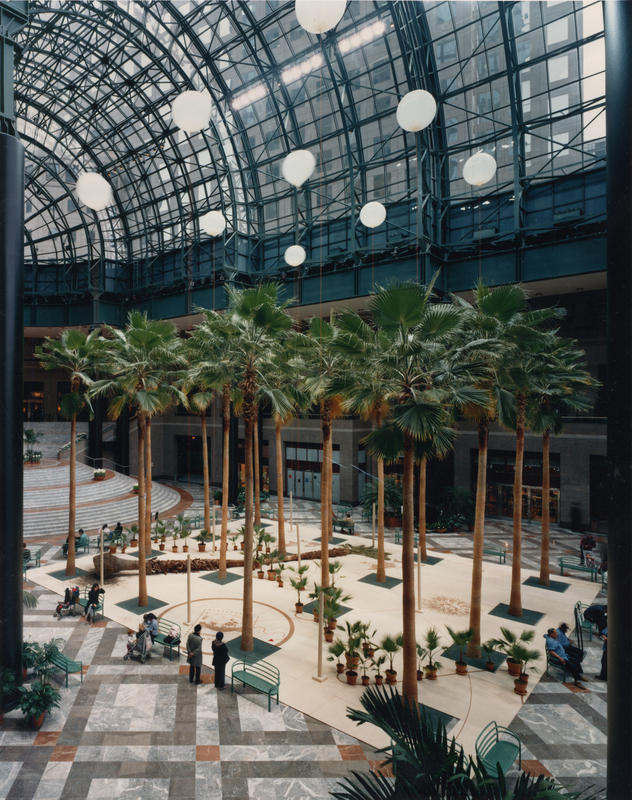 After suffering severe damage in the September 11th attacks, the Winter Garden underwent a $50 million renovation, reopening a year later. 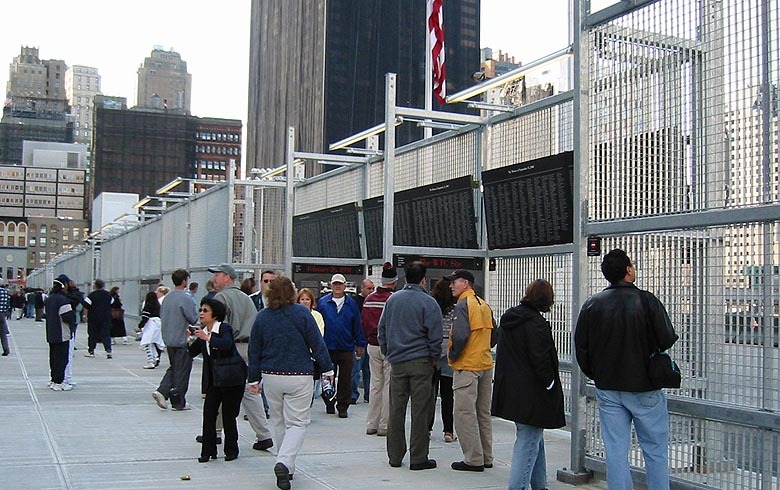 The passageway leading to the World Trade Center has been replaced by a glass façade, providing a new entryway to the space as well as a view of Ground Zero. Visitors to the garden descend a huge semi-circular staircase from the upper level to the palm grove below. 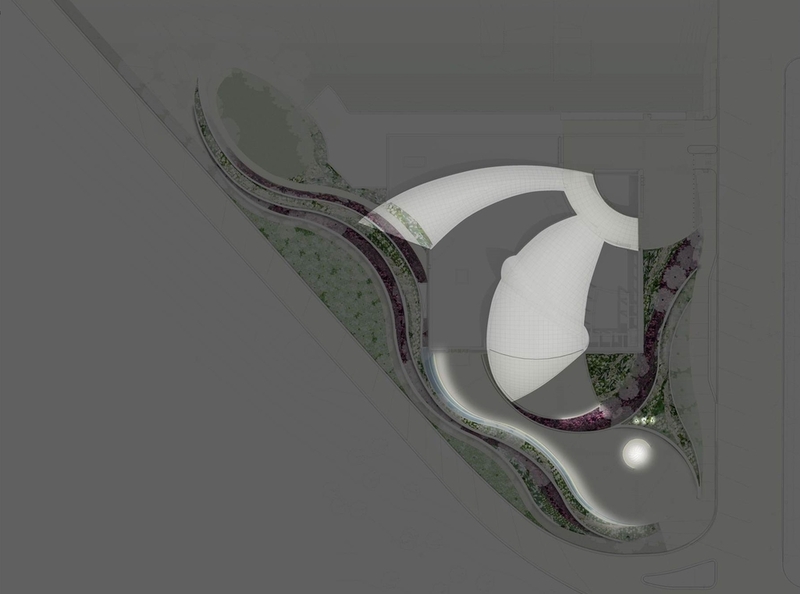 The garden’s glass walls are lined with shops and restaurants; movable public seating can be adjusted around the space’s perimeter. Newly created galleries along the walls host exhibitions. 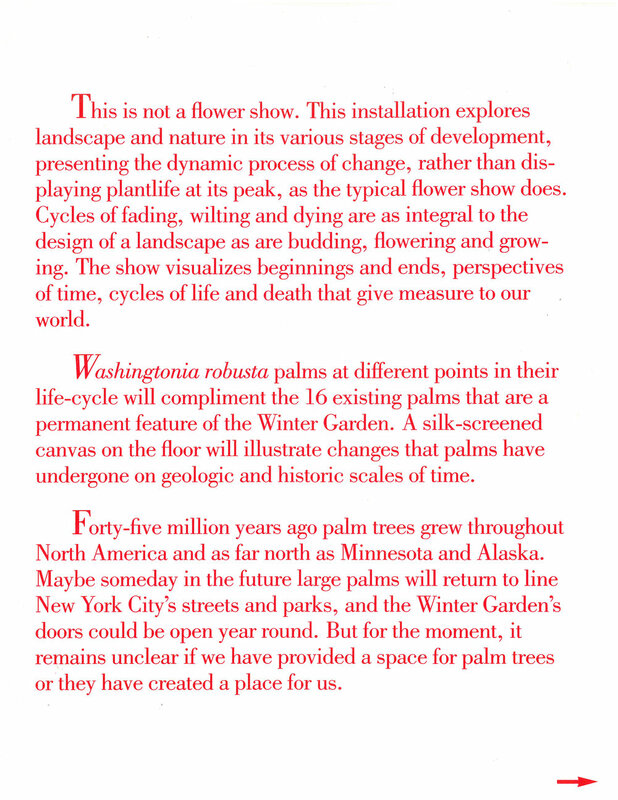 Sixteen palms are planted in a rectilinear grove, with the floor around them paved in diagonal patterns of imported marble. The palm variety is Washingtonia Robusta, a native American tree with a narrow trunk and lush foliage, rugged enough to withstand the hall’s dry environment and wide temperature range. Throughout Washington DC’s history, the National Mall has represented the heart of the city and, by extension, the nation. The Mall’s landscape is as diverse as its uses: hosting protests and celebrations, accommodating vast crowds and intimate moments and paying homage to the past and the future. Like the country it represents, the Mall reflects the difference, offering the hardiness of “landscape” as a counterpoint to the formal austerity of its buildings and monuments. 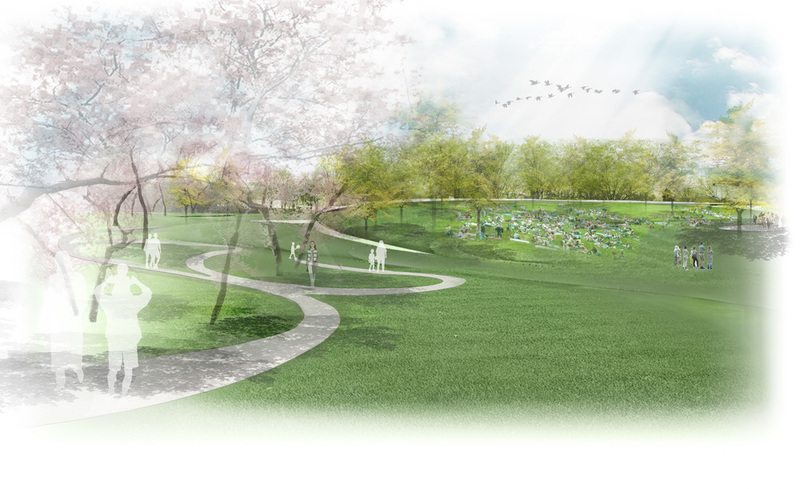 The Sylvan Way project is organized by a landform that flows east-west across the site, beginning with a new Oak Grove at the corner of 15th Street, which hosts an intimate Sylvan Theater for informal performances for up to 100 spectators. The landform continues and curves around to create the grass bowl for large spectacles, and bends back again to create the second grove, within which we have placed a “Sylvan Restaurant.” The line continues to create a playground within a small valley of ponds fed by a previously buried stream, and then carefully curls around the restored Survey Lodge to rise again in a gently angled lawn, which conceals a new maintenance shed. 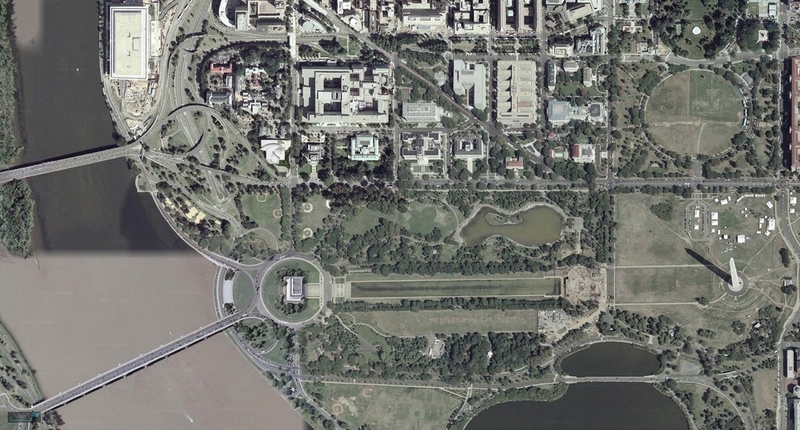 From this point, a new “cherry blossom” bridge leads to the Jefferson Memorial, bringing it and the MLK memorial closer to the Mall, extending the cherry walk and eliminating the confusing side trek which now requires three road crossings. This bridge touches down midway between streets in newly created wetlands, which help regulate water on the site. 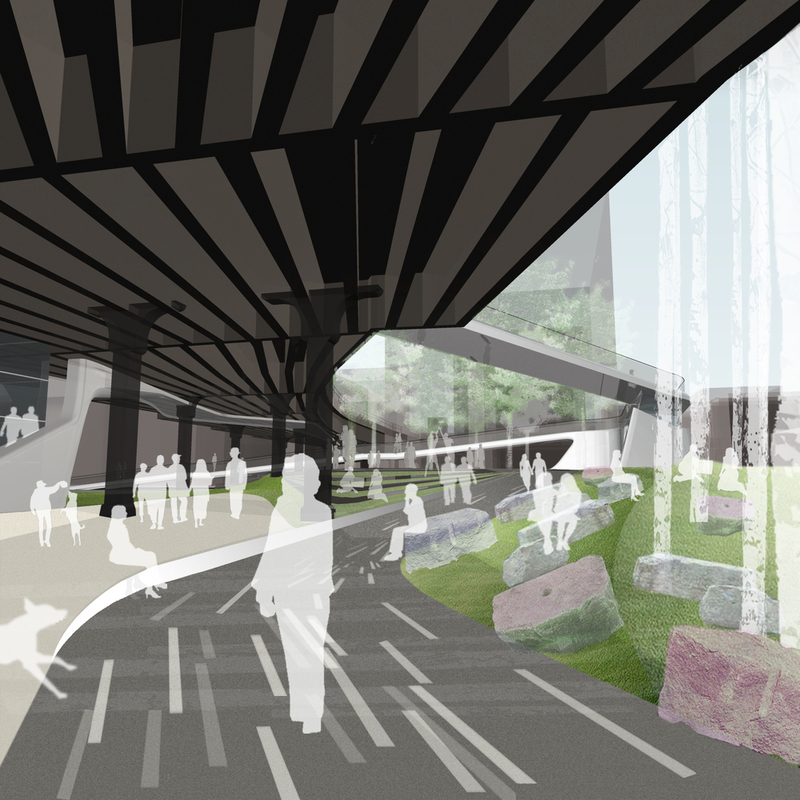 The primary landscape element of our scheme is the Sylvan Bowl, a grand new public space for the Mall where visitors can linger in the shade to see spectacles, picnic, or to attend an NPS presentation. 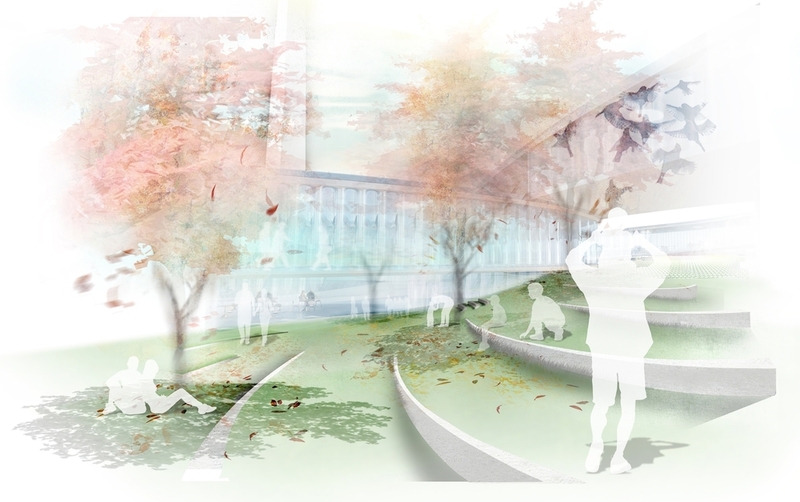 The grassy space is strategically “sylvaned” with trees, creating a shaded lawn where people can picnic, and rest. For the first time, people will be able to look directly up at the Monument behind a performance and enjoy everything from an intimate concert to a major event attended comfortably by 3,000 or even 10,000. The Sylvan Bowl’s stage is a stone circle 65 feet in diameter. Harkening back to the original 1916 Sylvan Theater, it includes a curtain of mist for this stage. When nothing is being performed, this will act as a fountain and play area for children. 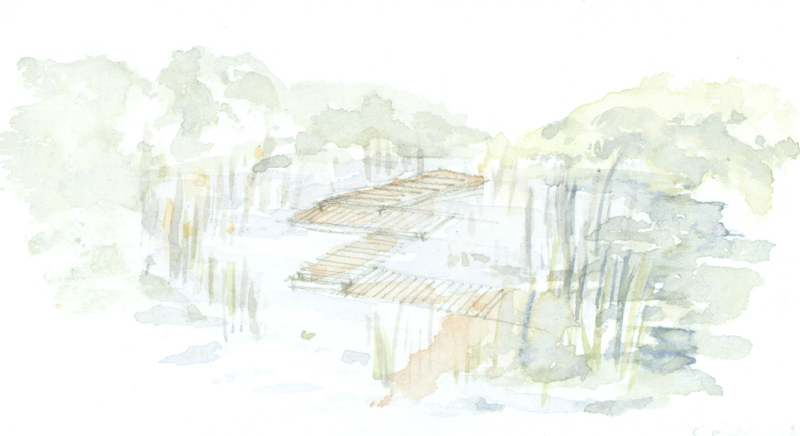 The simple materials of the stone stage surrounded by a thin channel of water, become part of the Sylvan environment of trees and grass. Other performance spaces include a small wooden stage in the Oak Grove, where a group of up to 100 can gather under the trees; another small stage close to the Survey Lodge; finally a smaller one in a courtyard of the building.. 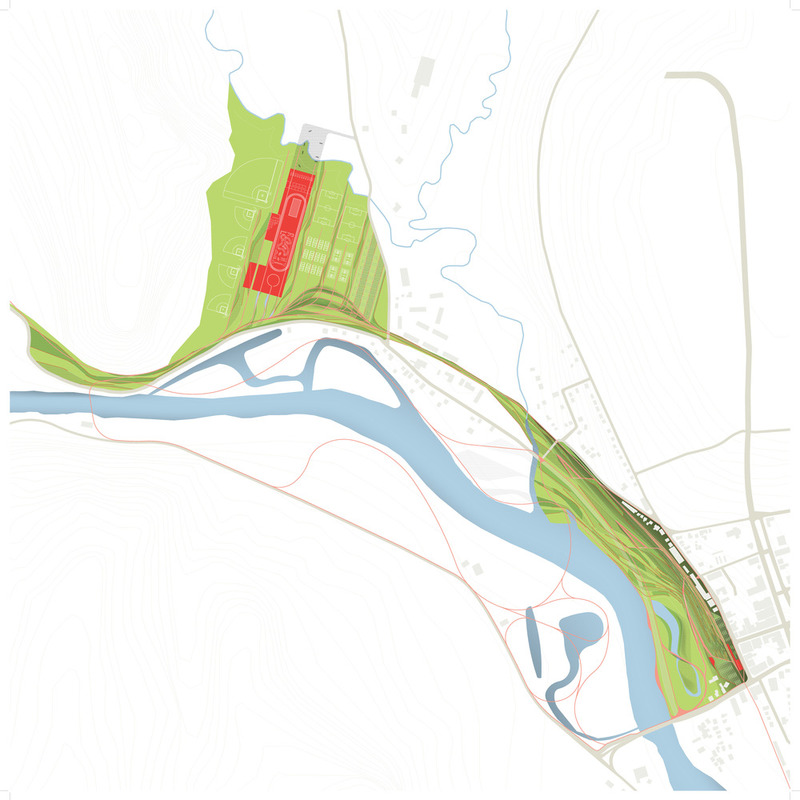 The design plays a dual role in reviving the historical on the site, while introducing elements of the contemporary. For the historical, the Monument and Survey Lodges are restored and their interiors redesigned; the mist curtain and grassy slope refer back to the original Sylvan Theatre of 1916; and the emphasis on theater recalls the importance of theater in the lives of Jefferson, Washington and Lincoln. Our present and future is represented by our focus on sustainability and the creation of a closed loop of soil recreation, water reuse, planting, recycling, and food production on site. With this approach, we enter the arena of our own times. 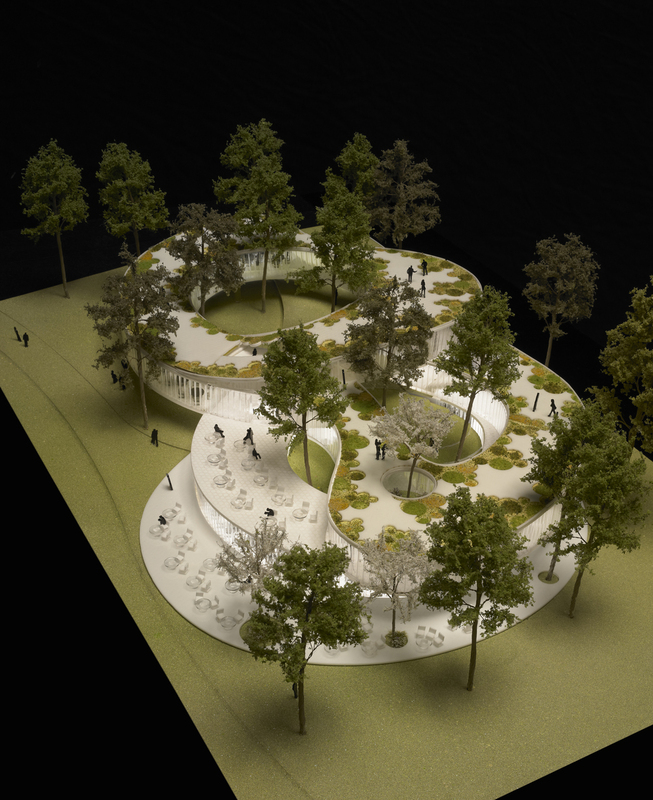 The “Sylvan Restaurant” is set within a new grove of trees at the west edge of the grass to accommodate the different programs creating three interior courtyards. The roof is a publicly-accessible spiral that supports a bounteous herb and vegetable garden for the restaurant, further emphasizing the site’s “bridge to Jefferson” and recalling Monticello’s embrace of agricultural landscape as an element in a uniquely American take on classical architecture. Each level of the building is seamlessly connected both internally and externally, through the publicly-accessible courtyards and rooftop. Within every level, the building’s functions intertwine with each other to become something more: a cafeteria formed around an open kitchen; a bookstore that doubles as a ”cultural gateway” to everything artistic happening in DC and that backs up on a flexible space for lectures, readings, performances; a restaurant that steps up to better and better views of the mall and where park rangers can eat lunch with visitors. 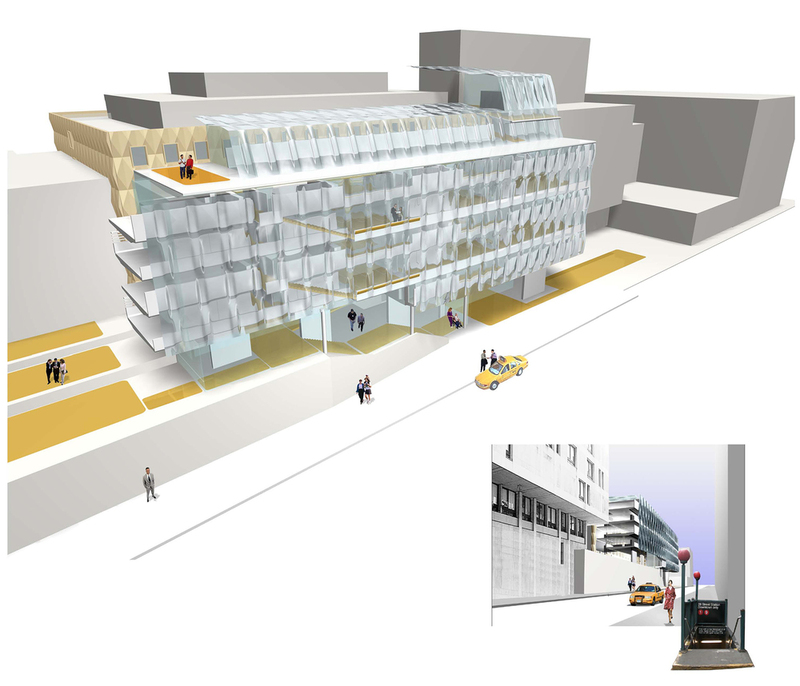 The second level, accessible directly from the top of the slope or via the largest courtyard accommodates the bookstore, the flexible event space and the entrance to a smaller full-service restaurant. We imagine, together with Local Projects, the bookstore as a “cultural gateway” to DC, providing up-to-the-minute information via electronic graphics and kiosks on the cultural life of the city. The Survey Lodge has been re-imagined as a place to rent wheelchairs, electric vehicles and recreational equipment. It has also been reconfigured to accommodate a vastly expanded number of bathrooms and is designed to provide a major rest-stop for tour buses and passers-by. This slope also provides gentle access to the new Cherry Blossom Bridge which leads from here across the wetlands to join the existing cherry walk and access the Jefferson and Martin Luther King memorials. The Monument Lodge will continue to serve in its historic role as the ticketing location for the Washington Monument. By removing the bookstore to the new Sylvan Restaurant building, the bathrooms and indoor ticketing accommodation can both be expanded and improved. Option A: a space defined by an hedge of flowering shrubs and grass in the center with a largetree as focal point. 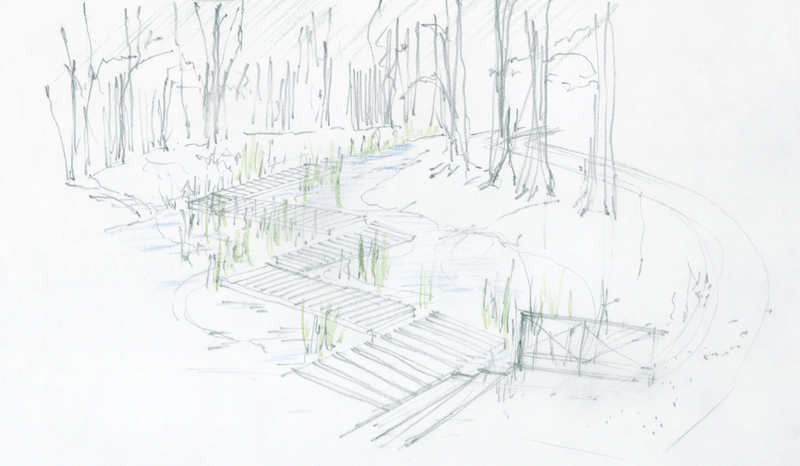 A water element (a small cast iron fountain ) and benches around the space will be included to animate it. The possibility of using this space for the wedding ceremonies or for the reception after the wedding was accepted and Arq. Vidal encouraged usto continue exploring it. 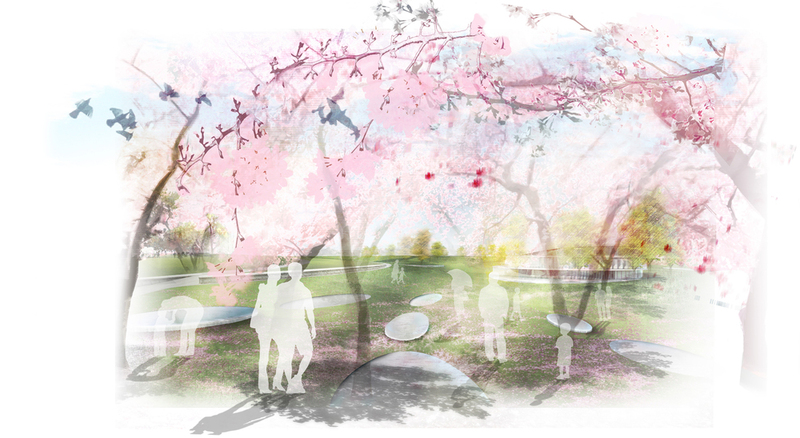 Option B: a central space planted with flowering trees in an elliptical shape, surrounded by grass and shrubs. In this case the benches are under the gallery. Conceived as a hard plaza with a paving pattern that emphasizes the axis and the inclusion of benches and a water element if the possibility of closing the plaza by night exists. We discussed the issue of the security by night and although we believed that the Café and the Health Center would generate activity, Arq. Vidal advised us to consider the inclusion of a gate. He also commented about the need to contemplate some outdoor furniture for the bar. We also talked about the importance of the “ totem’s” location in the Plaza as the symbolic element ofthe Civic Center. 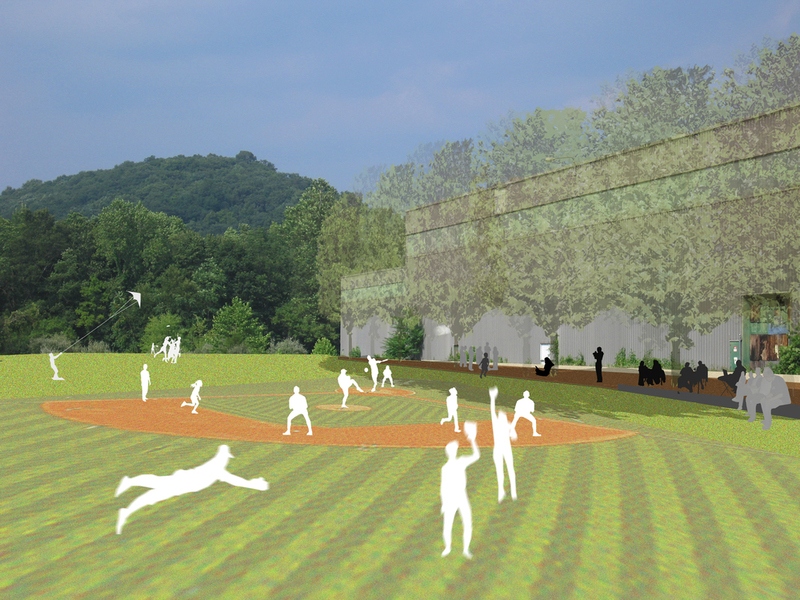 A space for basketball practice and a space for sitting under a large tree with stepping stones and a drinking fountain. 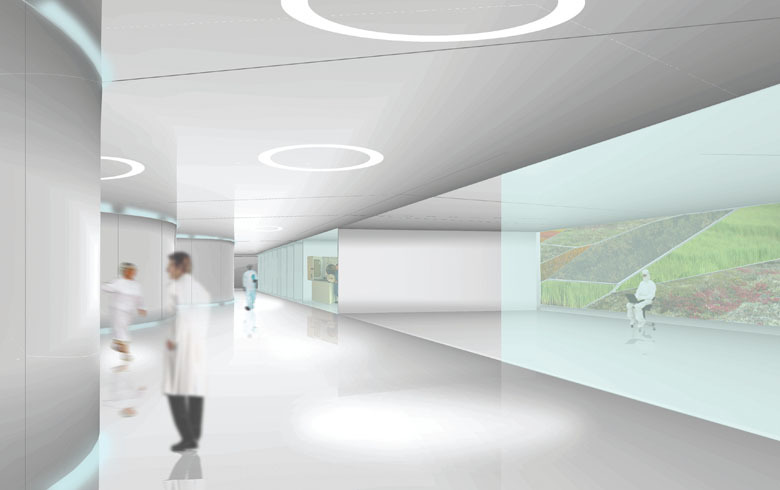 The surrounding walls will be treated with a kind of brick (nido de abeja) which allows the light to go through. Vines are proposed on the top. Arq. 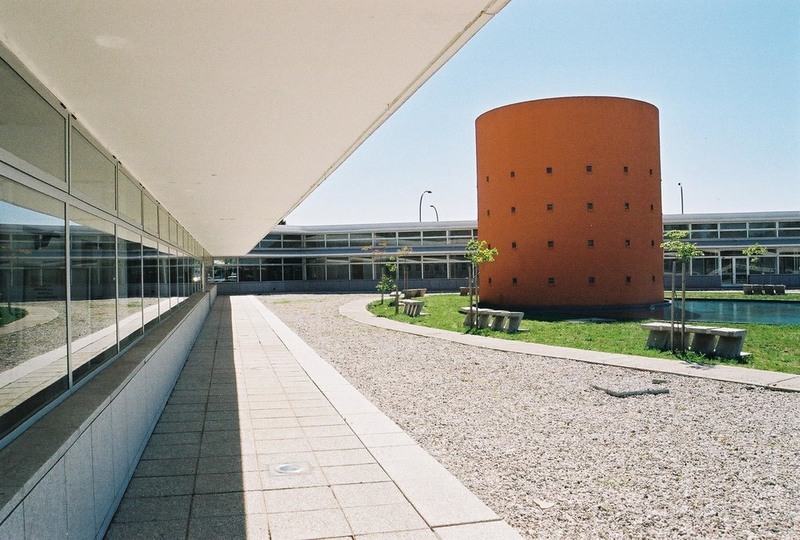 Vidal suggested to treat the space as an outdoor waiting room for the Health Center instead of a playfield. Option A: large trees spaced 9 to 10 m in between them. 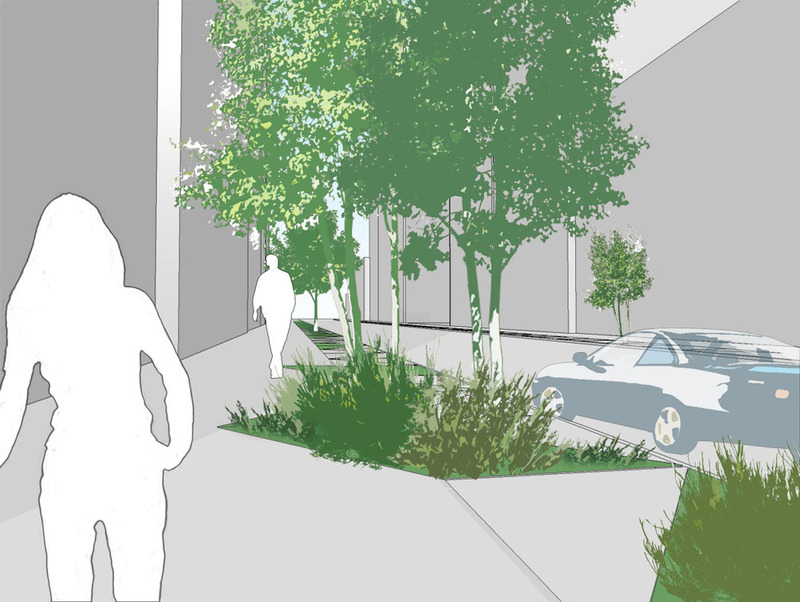 Option B: For the streets with parking places we proposed large trees combined with small trees in between them. For the other two streets, we proposedlarge trees spaced 10 m in between them . The species used are Jacaranda and Tipa. The access of public to the Civic Center would be primarily by bus, secondarily place by walk and bike and in the latter by car. Arq. Vidal express the need of provide bike racks (aprox. 20 units). He also suggested including a drop off for the Registro Civil. 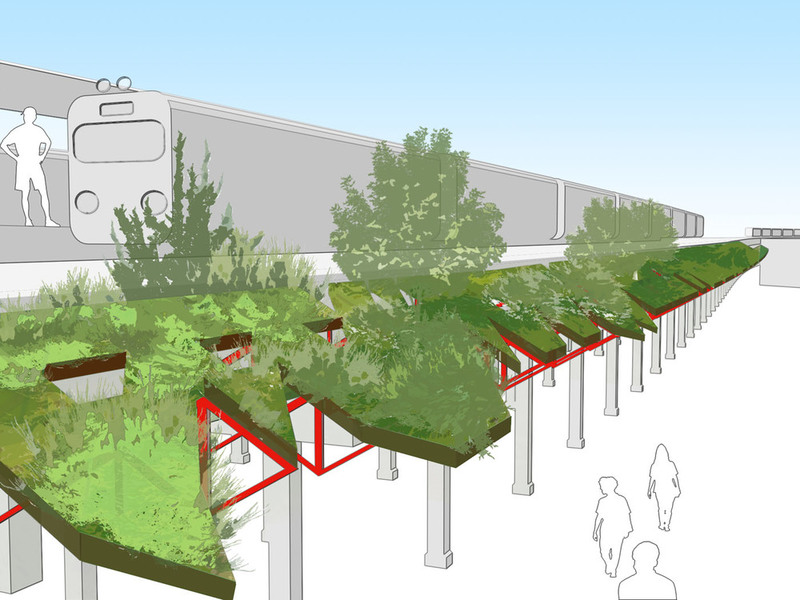 Anotherissue that was considered is the possibility of proposing a roof garden in some of the buildings as an improvement in the mechanical systems of heating and cooling. Located by the sea in Argentina’s largest beach resort city, Maral Explanada consists of a sloped landscaped terrain connecting three residential towers. The site sits above the rocky Atlantic shoreline at Playa Chica, one of Mar del Plata’s well-known beaches. 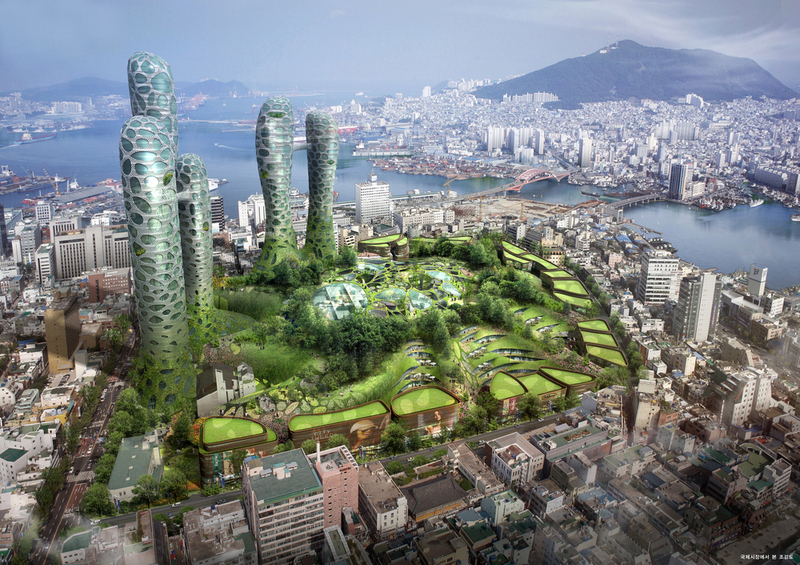 The three towers — 19, 21 and 23 stories tall — are arranged around a series of terrace gardens planted with indigenous plants. At the base of the tallest tower is a stepped, stone-clad podium with an accessible rooftop garden. Inside this podium is a large gym and indoor pool shared by the three towers. From the base of the towers, the land drops steeply to the sea. The landscape design mediates this 10-meter incline with a series of terraces that recreate the natural coastline. The terraces include spaces for walking and leisure, as well as an outdoor swimming pool. Native Argentine salt resistant species of various textures delineate the property’s boundaries separating private from public. In 2010 Balmori Associates and Work AC won an invited competition to redesign a 1 kilometer section of Hua Qiang Bei Road in Shenzhen. 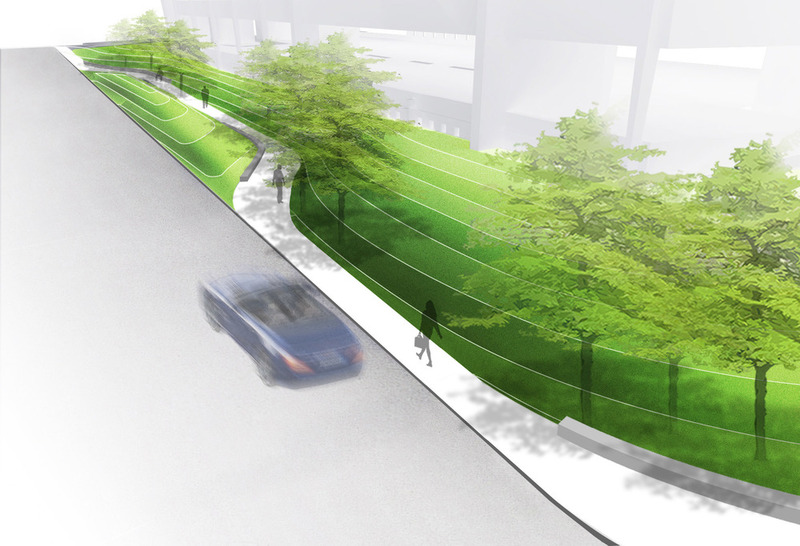 The design responds to the area’s growing commercial character by improving flows, organizing traffic and enhancing the pedestrian environment with a green streetscape. To strengthen the identity of Hua Qiang Bei Road we created a series of nodes of activity that project a vibrant new vision for the district’s future. These nodes take on different scales. The most visible are the five “lanterns” that define a new space of the street, in the sky, providing connections and enabling a major expansion of public space. We imagine the “lanterns” to resonate with the famous entrance gates to traditional Chinese streets, creating a strong and memorable image. The lanterns are like the needles of acupuncture: used at only a few, precise points to bring energy and organize the flows around them, letting the street breathe better between. They are also bridges, connecting one side of the street to the other. We also provided a wide variety of shade trees and seating types, our designed fountains and paving will improve both air flow and pedestrian flow. This is a new kind of urban design approach, we call it urban acupuncture: acting precisely and strategically to get through all the channels to create the maximum impact using minimal means. 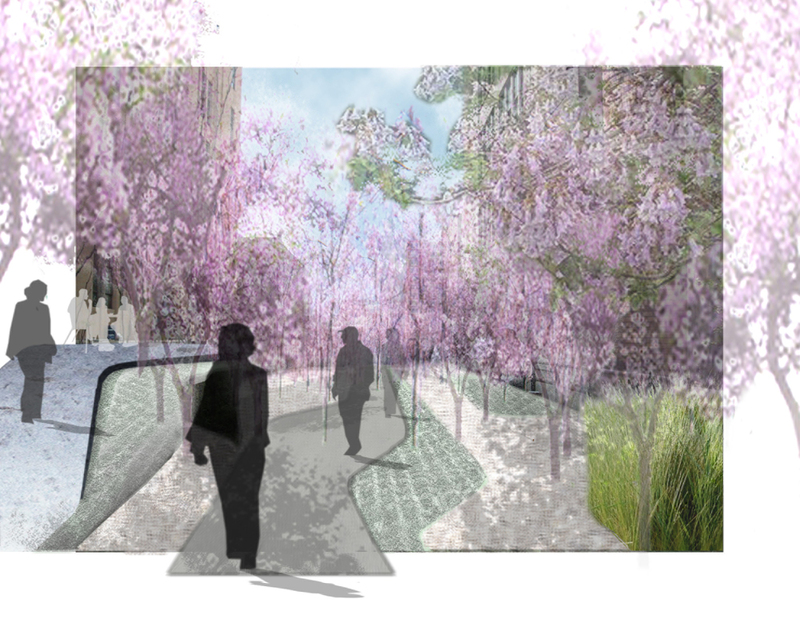 We use a systematic and synthetical Urban design method to combines the softness of landscape design, the precision of traffic engineering, and the power of architecture to improve flows, strengthen identity, and create new public space. 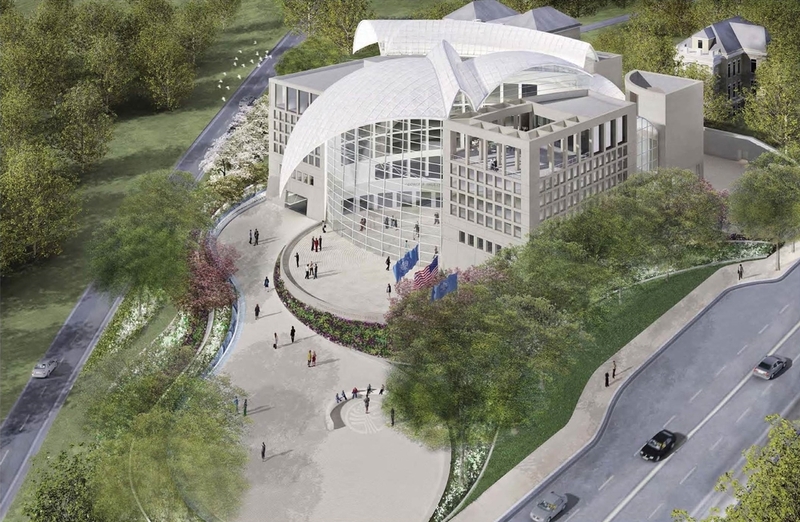 The Peace Institute’s landscape is designed as a garden; a garden that surrounds a circular foyer for groups to gather at the front of the Peace and Education Center. This foyer is contained, first of all, by semicircular benches which curve inwards around a long table with individual stools; contained beyond by “living walls” which separate the space from the two busy streets which intersect at its corner. The living walls are undulating walls of concrete which flow through the gardens and paths at various angles and heights. These inclined walls are draped with plants or contain pockets of planting. In several places they allow water to run down them and are lighted. These living walls serve several functions. They serve, first, as a line of security around the building’s perimeter. Second, they hide the constant movement of traffic around the two main streets by the site. Third, because they are planted they give the sense of a broader, thicker surface increasing the sensed distance from the traffic. Flowering trees and perennials add their color and texture to the enclosure in white and purple. White as a symbol of peace and as a reassertion of the white color of the wing-like roof of Moshe Safdie’s building. Purple used with restraint sets up the white more dramatically. The plants have been also chosen for scent, so that visitors are enveloped in perfume, color, and water once they enter the precinct. 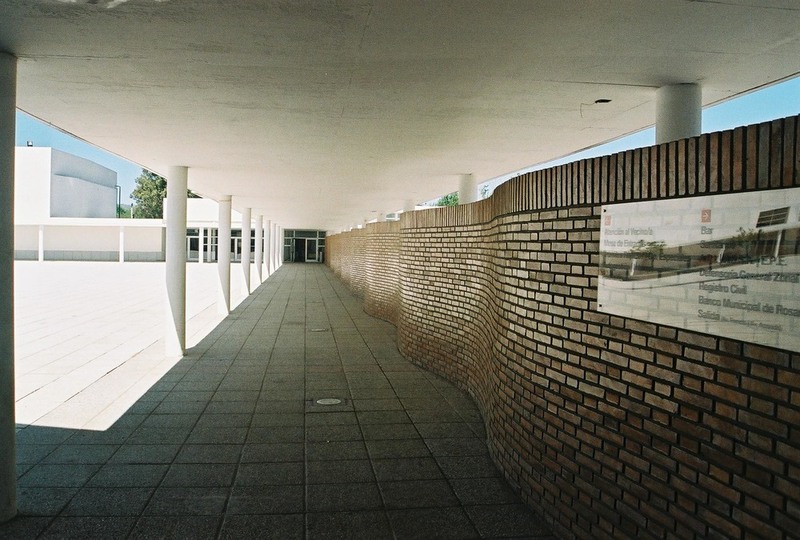 Beyond the circular foyer, the public passes by the edge of the terrace which fronts the building, but which you can enter only from the inside. The edge of the terrace allows for a view at the exhibition space below. The terrace itself is an extension of the Great Hall within. At this point , the visitor has dramatic views of the atrium and its translucent hovering roof above. 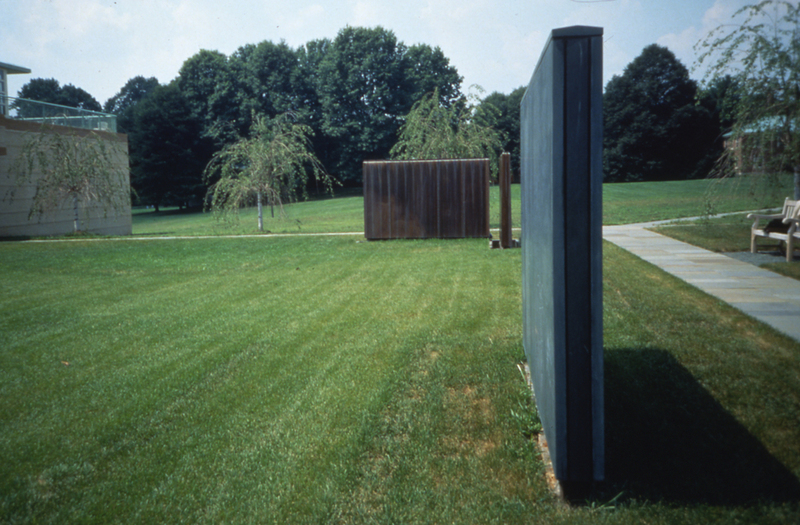 As the public ascends toward the entrance there are also long views toward the Institute’s gardens to the west.